Today, more than ever, with the increasing population the demand for drinking water has increased, and as a consequence the unloading. Hence is easy to understand the importance of a water treatment plant, essential to remove dirt from waste water, and their design, in which SMEA Engineering is very careful. Every time we wash our self, we clean the dishes or cook, we pour water domestic pollutants, which are better to be purified before going into the nature, and the same goes for industrial water. Nature conservation begin in our houses. Chemical-physical (which eliminates the phosphorus and nitrogen, separating the water from the mud). At the entrance, immediately in the so-called “bypass”, are verified some fundamental parameters such as the temperature and the pH (this in particular, is of fundamental importance for the biological treatment proper functioning). After the bypass, the first mechanical purifier for water is the grid: this is constituted by a series of metallic filaments which have the purpose of retaining the coarser parts that pass through it. Periodically, namely when the two levels before and after the grid differ by a certain amount, a comb passes between the casings and cleans the filter from impurities. The scraps are taken automatically to the washing system that operates the separation of organic (that go back to top of the plant) and inorganic material (that is inserted in bags and disposed later). Then the water continues its journey in the water treatment plant to the sand trap and the oil separator. On one side in fact the sand is not biologically disposable and could ruin the plant, on the other side oil and fats, although they are two organic components, could cause blockages or hinder the bacteria in the absorption of nutrients in the organic phase. To subtract the sand, we takes advantage of the higher specific weight of it with respect to water: in a tub, hot air is injected so that it generates a recirculation such to deposit only the grains in suspension and maintain all other substances; than a blade scrapes it off to the pumps that take the mixture into a tank where the sand is cleaned by any organic residues (listed at the beginning of the plant) while the washed granules are collected and prepared to be disposed. In parallel to the sand trap, operates the oil separator tank: here oils, fats and suspended material float on the calm surface of the water resulting in the so-called “floatation”, being then mechanically plowed away and taken to the sludge treatment. The next step is the primary sedimentation tanks. Here the impurities accumulation principle is the same, but having here a very calm liquid conditions, substances deposit on the bottom by decantation and generate the primary sludge, driven than by a shovel to a collection pit. At the end of this process you can define the mechanical treatment phase concluded, this means that most of the impurities and floating solids have been removed (about 40% of the solid organic load). In the next few steps you will take care of those suspended and dissolved. 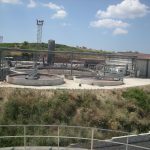 denitrification, where the nitrate is converted into nitrogen gas by other bacteria; is a process that, however, is carried out only in the absence of dissolved oxygen, that is why sludge resulting from the process of nitrification are carried in the anoxic tanks (free of dissolved oxygen), where bacteria metabolize the organic substances and produce the necessary enzymes for the nitrate to nitrogen gas conversion. 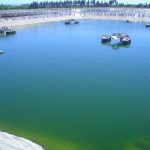 Removed the nitrogen, phosphorus is instead eliminated through the chemical treatment, with chemical precipitation using aluminum or iron salts which create a combination with phosphate ions and fall in the mud. After approximately 24 hours, the slurry pass to the final sedimentation tank at low current, where the aforesaid active sludge containing phosphorus are deposited on the bottom and are sucked by the pumps that bring it partly back to the beginning of the biological water treatment phase and partly (the so-called excess sludge, or the organic part of the substance transformed by bacteria in biomass) to the digester. The excess water flows out from the discharge channel, purified to about 99% of the total pollutants. 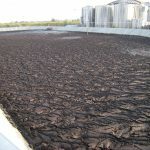 The mud will then be further treated by the industrial plant, but this process is explored in the appropriate section.